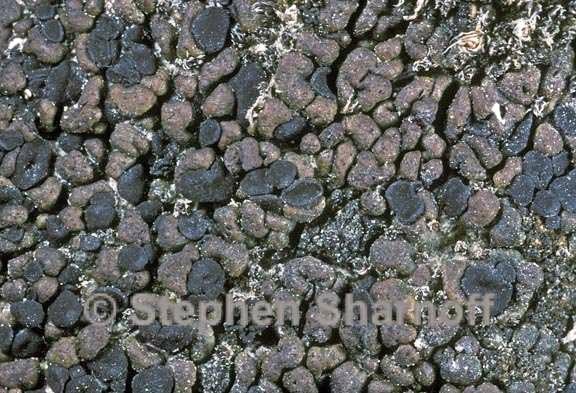 Life habit: lichenized, lichenicolous or not Thallus: squamulose squamules: up to 4 (-8) mm diam., scattered to adjacent, rounded, weakly convex to bullate upper surface: castaneous brown to dark brown, epruinose, dull or shiny, smooth or with shallow fissures, with scattered punctiform impressions developing into pores, lacking pseudocyphellae upper cortex: up to 160 µm high, lacking calcium oxalate margin: concolorous with upper surface Apothecia: up to 1.5 (-4) mm diam., remaining ± plane and marginate or plane and marginate when young, later convex and immarginate, epruinose; exciple: medium brown to dark brown (sometimes with a green tinge) in the rim, usually paler inner part; hypothecium: colorless to pale brown or reddish brown; epithecium: bright to dark green (K-, N+ violet) or medium brown (K-, N-) asci: clavate, 8-spored ascospores: ellipsoid to fusiform, simple or 1-septate, 8-24 x 3-5.5 µm Pycnidia: laminal, immersed, often below pores conidia: filiform Spot tests: all negative Secondary metabolites: various terpenoid patterns (chemotype 1, 4, or 6 of Timdal 1992, plus undescribed chemotypes 8 and 9). Host: cyanolichens Substrate and ecology: on soil and rock, at 400-1950 m World distribution: widely distributed in the Northern Hemisphere, Peru Sonoran distribution: Arizona, Baja California Sur, Chihuahua and Sonora. Notes: Nine subspecies were recognized by Timdal (1991) and two additional ones are described here. They are distinguished mainly by anatomical (spore septation, spore size, pigments), chemical (terpenoid patterns), ecological (soil and/or rock), and phytogeographical features. The subspecies are well separated, and intermediate specimens are not known. Five subspecies occur in the Sonoran area.